The 2019 Honda Civic Coupe is fun-to-drive, fuel-efficient, highly-versatile and now comes in what will be a wildly popular Sport trim. 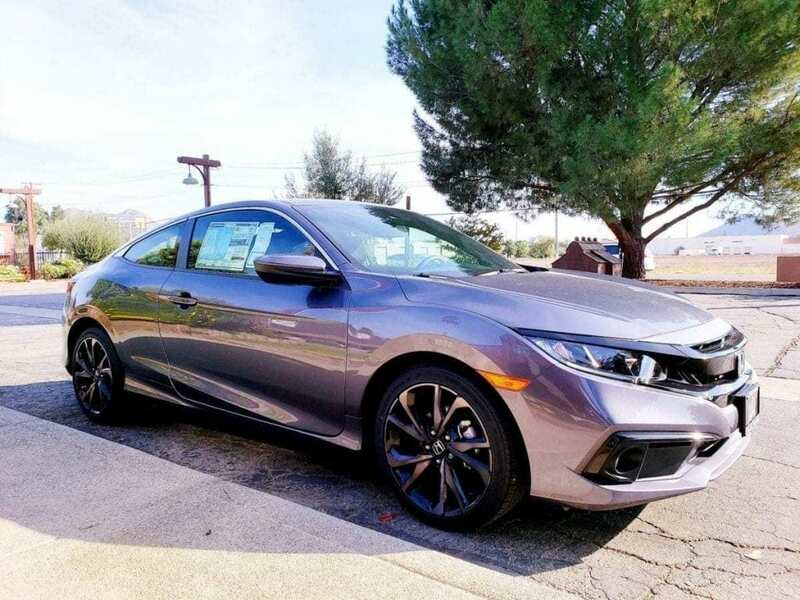 Featuring bigger wheels, paddle shifters and an overall incredible list of features for the price the 2019 Honda Civic Coupe is a great value. Even more so when you go to iDriveSoCal’s Honda partner in the Inland Empire – Rock Honda. Our Professor, Clinton Quan, made his way to Rock Honda in Fontana for a day of Civic Coupe Sport test-driving that included a stop in Corona and Menifee. Click play below to hear all the details in this iDriveSoCal podcast. Clinton Quan: The Sport trim is extremely popular. It’s a great looking car. You get those larger rims. The one I drove had the automatic transmission and the paddle shifters. There’s definitely plenty of power for a compact car. It’s very well-equipped, so you’re getting a lot of car. 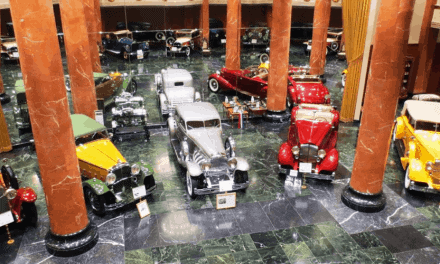 Tom Smith: Welcome to iDriveSoCal, the Podcast, all about mobility from the automotive capital of the United States, Southern California. Tom Smith here joined by the good Professor Mr. Clinton Quan. Say hello, Clinton. Tom Smith: Hello, my pal, my buddy, my friend, my amigo, my compadre, my comrade. Thank you for joining me as always. 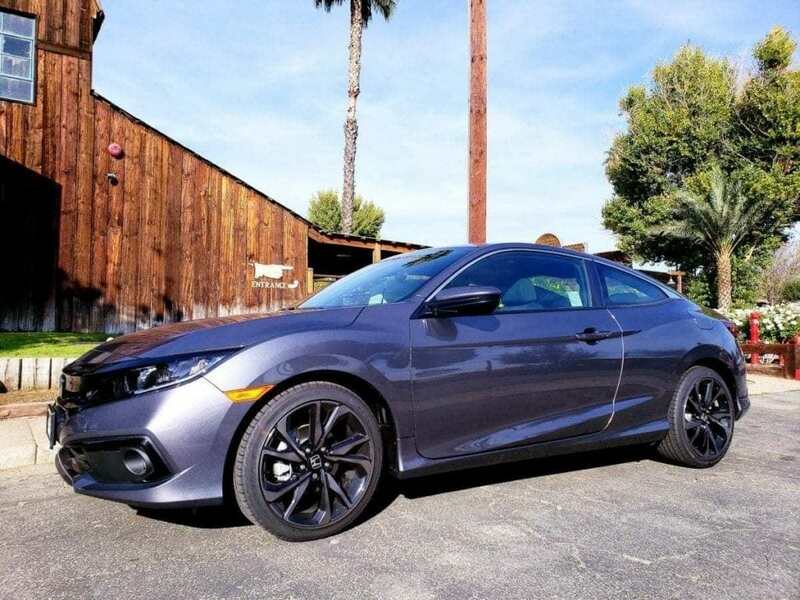 This podcast is a vehicle review and it is a vehicle review of the 2019 Honda Civic Coupe Sport. Tom Smith: Right? From our good friends out in the Los Angeles suburb of Fontana, California Rock Honda. Go out to Rock Honda. Say hello to our friends out there. General manager David Latif, his right hand, Hamid Javid, Veronica Orozco, one of the sales manager, Ruben Serna, service director. Love all you guys out there at Rock Honda. Tom Smith: No, excuse me. Honda Civic. Let me screw that up. The 2019 Honda Civic Coupe Sport. Tom Smith: Take it away, Professor. Clinton Quan: Well, for 2019, Honda came out with a brand-new trim for the coupe. They also have a brand new trim for the sedan as well, the Sport, which was available in the hatchback. Tom Smith: Okay. Hold on. It’s the sport, which has the new trim. Okay. So it’s only the sport? Tom Smith: Because you are going to drive the Touring. Clinton Quan: Yes, but they already had a touring before. Tom Smith: Okay. The Touring trim wasn’t going to be new. It just the Sport trim that’s new. Clinton Quan: Correct. Yeah. It’s just a new trim. Clinton Quan: The Sport trim slots between the base LX and the mid-level EX. Tom Smith: The base LX, the mid-level EX. Tom Smith: They don’t do the EXL? Clinton Quan: There is no EXL trim for the Civic. Tom Smith: For the Civic. Okay. You got the LX, the sport, the EX, the touring? Clinton Quan: For the base XL and the Sport trim, that comes with a2.0-liter inline-four that produces 158 horsepower at a 138 lb-ft of torque. For the upper-level EX trim and the top of the line Touring trim, you get a 1.5 inline-four turbo charge that produces 174 horsepower and 162 lb-ft of torque. 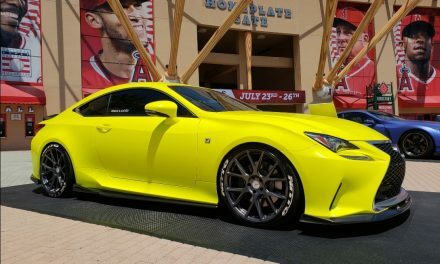 The LX starts at around $20,000. The sport I think it’s around $21,000. Then you move up to the EX, which is around $23,000, and then the top line touring trim will go for around $27,000. Tom Smith: Okay. As always, these prices are in this case very rough approximates of MSRP. Again, no matter what you want, go to Rock Honda. They’re going to take the best care of you. 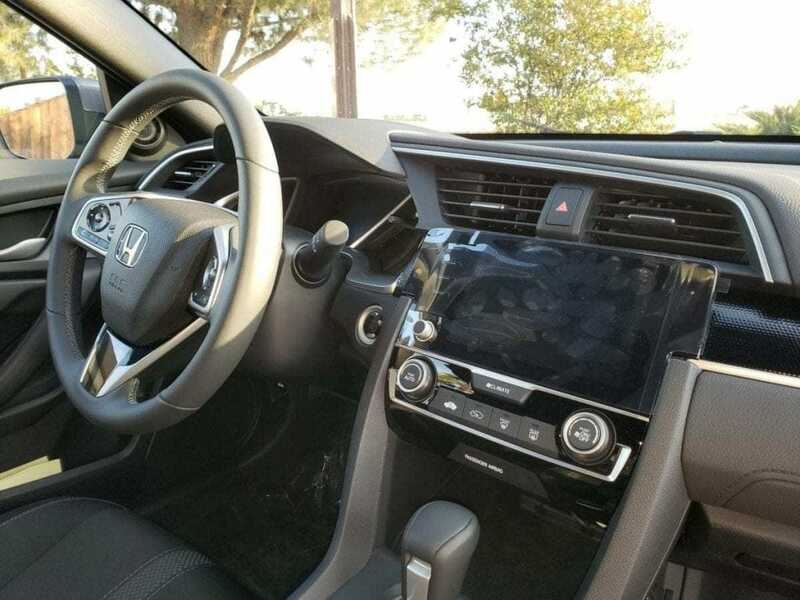 But above and beyond all that, you need to get the car equipped to your liking and then the price is going to reflect that, but always go to Rock Honda. They’re going to take care of you. Carry on, Professor. Clinton Quan: I wanted to mention that it’s not surprising that Honda came out with the Sport trim for both the sedan and the coupe. For those of you who are familiar with the Honda Accord, the Sport trim is extremely popular. It’s a great looking car. You get those larger rims. In the case of the Civic, it comes with 18-inch wheels. It looks really, really sharp with those bigger wheels. The one I drove had the automatic transmission and the paddle shifters. There’s also an eco-mode that’s available, but when it’s not in eco mode, it gives you plenty of power. There was certainly no loss of power driving at much higher highway speeds. Tom Smith: Professor got on it is what it sounds like. But don’t worry friends at Rock Honda, Professor takes the utmost best. We always take care of the cars that we test drive, but we drive them, right, so that we can report on them appropriately because that’s the fun part of our job. Clinton Quan: If someone is looking for a Sport model, I’m sure they’re going to want something that’s more enthusiast oriented. Tom Smith: This is that? Clinton Quan: Yes. Well, at least definitely in appearance, but also there’s definitely plenty of power for a compact car this size. It will still give you a decent fuel economy. Tom Smith: Decent, what are we getting around? Clinton Quan: I believe it’s 30-38. Tom Smith: I mean by my book. Tom Smith: I saw pictures of the car. I think it’s a beautiful car. I think it’s a very appealing car. As you point out, the Sport models that Honda puts out, it’s very understandable, it’s very logical that their Sport models are so appealing and sell so well because they just do the aesthetic things, but it’s still got plenty of engine. Clinton Quan: It’s very well-equipped, so you’re getting a lot of car for a good value. Tom Smith: Hey, you’ve been listening to the podcast, you know that I personally am all about value. Badge is great, but I don’t need the badge. Give me all the stuff. This definitely has that. Take us on the outside. We kind of already did that, but let’s go around the outside specifically. Anything to highlight there? Clinton Quan: Well, I think what’s really interesting about the Civic Coupe is that even though it is technically a coupe and it has a trunk, the back really has a sloped design to it. It looks actually more like a hatchback. You would think that the entire back pops up, including the back window, but it really is a coupe with a very short trunk. Tom Smith: Plenty of space back there still? Clinton Quan: There’s a decent amount of space. You wouldn’t expect a whole lot because it is a coupe. The back of the trunk, it’s not very deep. But for someone who’s looking for a two door, I think this would be more than adequate in terms of cargo space. Tom Smith: Yeah. Good point. Clinton Quan: …there’s no other automobile company that produces a two-door of their compact sedan anymore, it definitely has that hatchback look to it. Clinton Quan: It’s actually a coupe. Tom Smith: …a coupe with a trunk. Clinton Quan: Yes, a coupe with a trunk. I think it looks best from the three-quarter rear. Clinton Quan: That’s the picture you saw. Tom Smith: Yeah. That’s the picture that you sent me. Tom Smith: I’ve seen other pictures online, what not. Okay. Very good. That’s the outside. Take us inside. Clinton Quan: Inside, well, we did a vehicle review of the Civic Sedan last year, the 2018. It doesn’t really look that much different. I believe the big change is that now they do have a volume knob for the audio controls. Tom Smith: Oh yeah. That was a big thing for some of the reviewers. Clinton Quan: That was the big change. Tom Smith: A little bit more user-friendly. Clinton Quan: …more intuitive for most people. 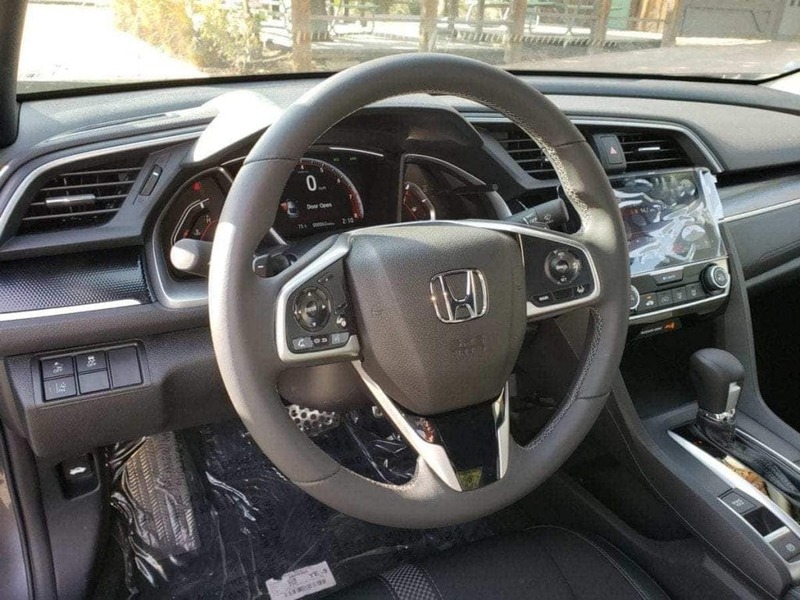 It’s got a sporty three-spoke steering wheel, a large tachometer with a digital speedometer right in the center and flanked by the oil temp and fuel gauge on both sides. Tom Smith: Adding to that sportiness. Tom Smith: You mentioned paddle shifters, right? Tom Smith: Did it brake for you automatically or was it just a warning? Tom Smith: Nevertheless. Now is that part of the Honda Sensing? Tom Smith: The safety features. Clinton Quan: All the safety features come standard, which is another added value for it. Tom Smith: Yeah. You got to love that. Clinton Quan: Yes. It’s got the Lane Keep Assist. Tom Smith: It has a backseat. Tom Smith: Are you able to comfortably… A lot of backseats aren’t very useful. But in the case of Hondas, usually, they are. In the case of this vehicle, is it still a useful backseat? Clinton Quan: I would say it’s decent for a compact coupe. Tom Smith: Okay. It’s a backseat that’s actually usable as well. Clinton Quan: Yes. Definitely very comfortable for children and smaller adults or smaller adults. Tom Smith: Or short drive adults. Tom Smith: …make it work. Clinton Quan: You could also use it as cargo space in the back, right? You could put your clothes back there. Tom Smith: Right. Absolutely. Okay. Clinton Quan: In terms of the space in the front for the driver and the passenger, there’s plenty of space. Tom Smith: Plenty. Yeah. Yeah. Clinton Quan: It’s very, very spacious. Tom Smith: It’s not top three things. Tom Smith: Yeah. Do you want to do top three things? We’re there? Clinton Quan: I think we’ve covered everything. We’ve talked about the outside, the inside, the engine. Tom Smith: We got the engine. Okay. Clinton Quan: We got the pricing. Tom Smith: All right. All right. It’s been a while since we’ve done a vehicle review. Clinton Quan: Yes, it has. Tom Smith: All right, Professor. Top three favorite things about the 2019 Honda Civic Coupe. Clinton Quan: Top three. I think I mentioned this last time as well, but I’m going to have to go back to it again because as soon as I sat in the vehicle. That was one thing I really noticed and stood out to me is the outward visibility with that low hood and the cowl gives you excellent visibility. Tom Smith: You taught me that word, cowl. Tom Smith: Right. Of course, I do. Of course, I remembered. Explain cowl again for those that don’t know. Clinton Quan: Well, it’s that intersection between the windshield and the hood. Clinton Quan: The windshield and the hood. Right at that point right there. Tom Smith: That’s when you have plenty of space. It gives you a feeling of comfort. Clinton Quan: If it’s lower, then you get a much better visibility of the road. Clinton Quan: I remember when I was I think middle school and I was riding in a friend’s Honda, that was one thing I noticed the first time I sat in the vehicle. It’s just so low, so you see the road right in front of you. Tom Smith: Which gives you a feeling of safety, a feeling of control. That you’re in control of the road and feel safer as a driver, as a passenger. Okay. Very good. That’s your number one thing is the vehicle’s cowl. Clinton Quan: The vehicle’s outward visibility. Clinton Quan: I’m going to have to also go with the ride of the vehicle. For a compact car, I thought the ride was very smooth, whether you’re talking about on highways or on surface streets. Tom Smith: That’s what I meant to get us to. Didn’t really cover the ride of the vehicle. The ride of the vehicle. Where did you go? Tom Smith: You know what? I know where you went because … Well, okay. Let me take this back. I meant like specific roads. Okay. The Professor… I got to explain this one. Tom Smith: …in Menifee. We just did a couple of podcasts about those things, which are very neat events and venues. In the case of the museum, it’s obviously a venue. The events, the automotive show, the auto show only happens once a year, but both two cool things. That’s why he said, “Oh, well, you know what I did.” Well, yeah, but the roads that you went on. Was it all surface streets? Was it all highways? How did it drive on those different road conditions? Clinton Quan: I drove both on freeways and on highways. Took the 15 down to Corona and then after lunch at Shops At Dos Lagos. I took one of the highway routes out to Menifee. Tom Smith: Okay. I just completely destroyed the flow of your top three things. Professor’s top three things. Again, number one is? Tom Smith: Number two is? Clinton Quan: Number three, I’ll probably have to go with the fuel efficiency of the vehicle. Awesome fuel efficiency, right? 1. Outward visibility – cowl. Tom Smith: All right. Well, fantastic. Professor, thank you, as always for yet another wonderful vehicle review. 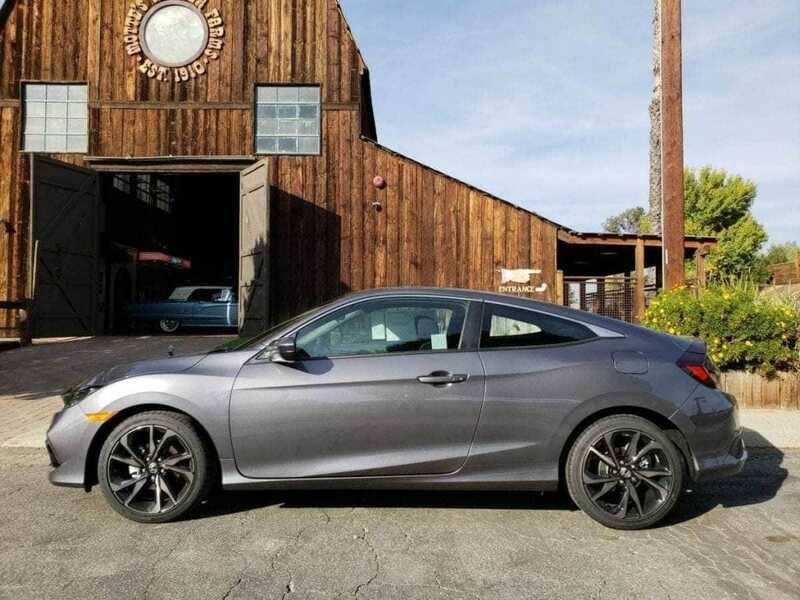 In this case, the 2019 Civic Coupe, Honda Civic Coupe from our good friends at Rock Honda in the Los Angeles suburb of Fontana, California. Go on out to Rock Honda. Say hello to the general manager Mr. David Latif. Love you guys out at Rock Honda. Hamid Javid, Veronica Orozco, Ruben Serna, service director. Tell them that Tom and Clinton and the iDriveSoCal team sent you. Rock Honda, we love you guys. Thank you for being great partners of the show. Professor, thank you as always for yet another perfect vehicle review. Thank you as always for tuning in. For iDriveSoCal, I’m Tom Smith. We will talk to you soon.